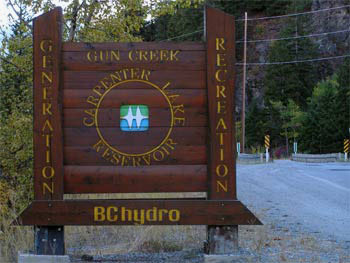 The largest campground within the map area is the Gun Creek Campground which is maintained by BC Hydro. 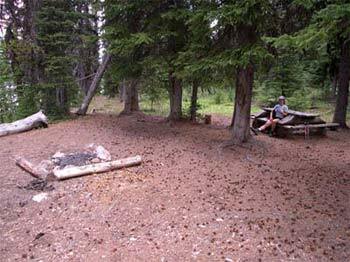 The campground is located on Road (Highway) 40 ~8.0 km E of the Hurley River FSR (Gwyneth Lake Rd)/Road 40 junction and ~3.6 km W of “Tyax Junction” (junction of Road 40 and Tyaughton Lake Rd. It is well signed and hard to miss. It sits next to Carpenter Lake and Gun Creek. Open year round. 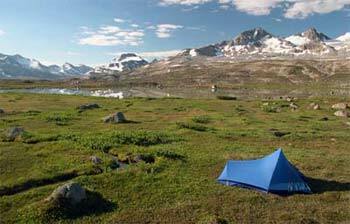 13 campsites. Maintained mid-May to Oct – pack out garbage in off season. No drinking water. Free. See website www.bchydro.com for more info. – Friburg FRS located on unsigned Tyaughton Lake Rd on the shores of Tyaughton Lake at ~7.8 km N of Tyax Junction. Right across the street from the unsigned trailhead for Tyaughton Creek Trail. Good location for mountain biking in Taylor/Pearson basins. Free. – Tyaughton Ck FRS located on Mud Ck–Paradise Ck FSR next to the confluence of Tyaughton Creek and Relay Creek at ~1.6 km N of the Mud Ck-Paradise Ck FSR/Mud Ck FSR junction. See Detailed Trailhead Access section below for Tyaughton Creek Trail for more info. Free. – Gun Lake FRS located off the Gun Lake West Rd next to Gun Lake. Free. – Mud Lakes South FRS and Mud Lakes North FRS are both located on unsigned Mud Lakes Rd (a continuation of Mud Ck FSR). 2WDHC vehicle required. See Detailed Trailhead Access section below for Tyaughton Creek Trail for more info – follow Mud Ck FSR to its end and continue along unsigned Mud Lakes Rd (decommissioned). 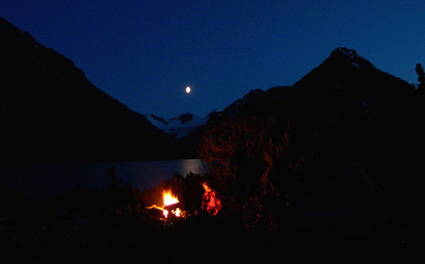 The 2 campgrounds are located next to lakes. There is another camping area between these 2 campgrounds. Free. Popular area for dirt bikes, quads, sleds, and 4WDs. Use our Southern Chilcotin Mountains Trail Map – GPS Based – to help you find the roads, campgrounds and trails in this area. Several established campsites (not associated with the campgrounds) exist off the access roads shown on the map such as near Tyax Junction and Mowson Pond. Trailhead camping at Jewel Creek Trailhead (for Gun Creek Trail) is ample. There is a large grassy area which doubles as a parking lot and there are several campsites on the N side of the creek off the trail. Some camping space is available at the trailheads for Slim Creek Trail, High Trail, Taylor Creek Trail, Lower Tyaughton Hiker’s Trail, Paradise Creek Trail, and Relay Creek Trail. There are 2 campgrounds located next to Spruce Lake – the campground on the N end of the lake is much larger and is close to the floatplane landing. 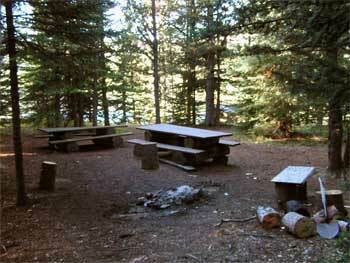 Recently, a new food cache was added to the Spruce Lake N Campground by BC Parks. 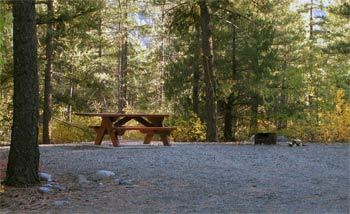 All other camping areas within the park boundaries are established campsites with no facilities. Use only existing fire pits and use caution with campfires. Hang food and keep a clean camp. Exercise no-trace camping. 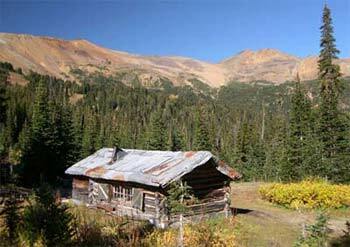 An old, yet functional, backcountry cabins exists in Taylor Basin. This is Taylor Cabin which is open to the public. Please use this cabin with respect and care. 4 bunks and stove. 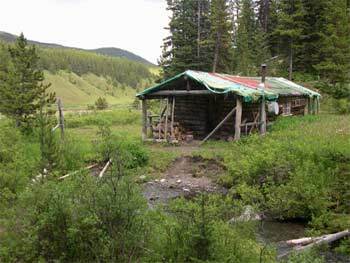 The Gang Ranch owns the old Graveyard cabin (somewhat leaky) in Graveyard valley and the Beaver Valley Cabin in Lone Valley. The Gang Ranch has been kind enough to allow backcountry travelers to use these cabins when not in use by their staff. Use with caution and care. 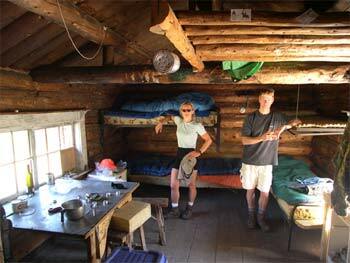 More information regarding backcountry camping and cabins will be included in the Trail Ventures BC’s upcoming guidebook for this area.